(1) Department of Neurosurgery, Hospital General Universitario de Alicante, Alicante (Spain). (2) Department of Anatomy and Histology, Universidad Miguel Hernández. Campus de San Juan, Alicante (Spain). The brain sulci and gyri constitutes the main cortical and neuroanatomic limits, landmarks and operative corridors. The identification of these anatomical structures before and after performing the craniectomy can help us delimitate the intracraneal lesions and preserve as much as possible the neurofunctional and eloquent áreas that lies around with the aid of actual and modern technology. 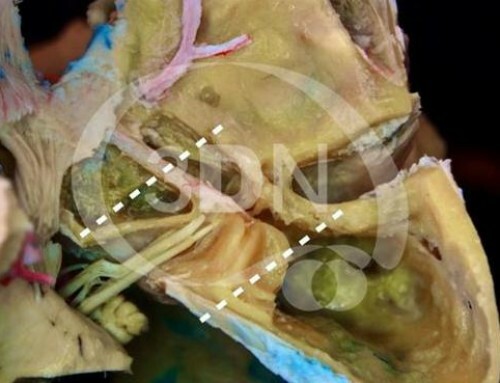 It´s difficult to identifying these anatomical structures intraoperatively with precision and thats why the main purpose of this study is to establish cortical and sulcal key points of primary microneurosurgical importance in order to facilitate the placement of the craniotomies and the identification of the main brain sulci, thereby providing a sulcal base anatomic framework. The anterior Sylvian point (ASP) is a cisternal like enlargement of the Sylvian fissure (SyF). Limits of the ASP: Superior: Pars triangularis; Inferior: superior temporal gyrus (T1); Posterior: Pars opercularis; Anterior: Pars orbitalis. The ASP divides the SyF into an anterior and posterior segment and has a constant location. This anatomic point is the best place to start the opening of the SyF since is the point of maximum separation of the frontal and temporal operculum. The suprasylvian structures (fronto-parietal operculum) should be imagine as a series of V and U shape gyri as shown in the picture above. I- The most anterior V shape gyrus corresponds to the Pars triangularis (color orange on figure 1). Anteriorely to this gyrus is the Pars orbitalis (shown in color red on figure 1). II- Posteriorely to the previous gyrus we can find a U shape gyrus, the Pars opercularis (colored brown gyrus. figure 1) . This gyrus is limited posteriorely by the precentral sulcus. Together the pars triangularis and opercularis constitute the motor speech area of Broca in the dominant hemisphere (Brodmann áreas 44 and 45). 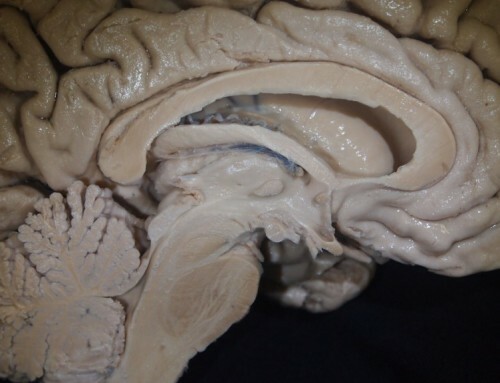 III- The next U shape gyrus is called the Subcentral gyrus (Yellow colored on figure 1), also called the “Rolandic operculum” or the classically named “inferior frontoparietal plis de passage of Broca”. Just below and over the Sylvian fissure is situated the inferior Rolandic point (IRP). This gyrus is visible in 95 % of the cases after the dura opening, the other 5 % of the cases is hidden under the superior temporal gyrus. The subcentral gyrus contains the Rolandic central sulcus and therfore formed by the primary motor and sensitive gyrus. Anterior limit: precentral sulcus; Posterior limit: postcentral sulcus. IV- The third U shaped gyrus (shown on light blue) is located posteriorely to the postcentral sulcus. Corresponds to the arm shaped gyrus that connects the postcentral and supramarginal gyri. V- The inverted U-shaped gyrus (Green figure 1) completes the supramarginal gyrus and it connects inferiorely to the most posterior part of the superior temporal gyrus. figure 2. The opening of the SyF at the level of the ASP shows very soon the insular apex on its depth. The Insular limen wich is the point were the middle cerebral artery bifurcates is located inferiorly and posteriorly (1-2 cm) to the ASP under the depth of T1 and corresponds to the uncinate fasciculus wich connects parts of the limbic system. The opening of the SyF posteriorly to the ASP exposes the insular region and the opening of the SyF anteriorly to the ASP leads the surgeon to the suprasellar cisterns. The distance between the ASP and the IRP along the SyF is of arround 2.3 cm (2-2.5 cm). See figure 2. figure 3. 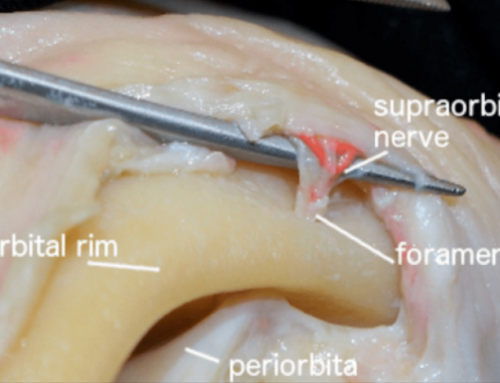 The ASP is related with de external craneal surface at the ANTERIOR SQUAMOUS POINT wich is defined as the point located at the uppermost portion of the junction between the Squamous suture and the sphenoid´s greater wing. (see figure 3). The IRP In relation with the cranium, lies at the junction of a vertical line just anterior to the tragus (approximately 4cm above the tragus) and the most superior part of the squamous suture (superior squamous point). Another way to get to the same point (IRP) is to measure 2.5 cm posterior to the Pterion over the squamous suture line as referred by Rhoton Jr. (Figure 5). The Inferior Frontal Gyrus (IFS) can be connected or almost connected with the Precentral Sulcus (PCS). This junction point is called The IFS/PreCS meeting point, a practical neurosurgical key point that can help us localize the precentral gyrus, just posterior and over the precentral gyrus of this point, correspond specifically to the face motor activation area and also delimitates the middle frontal gyrus (F2) from the inferior frontal gyrus (F3 / frontal operculum). See figure 6. The Stephanion point is a craniometric point at the level of the intersection between the coronal suture and the superior temporal line. Normally, the IFS/PreCS meeting point lies around 2 cm posterior to the Stephanions. An easy way to delimitate Brocas area on the dominant hemisphere is by localizing the four craniometrical points seen on figure 7. a) the Stephanion, b) 2 cm posterior to the Stephanion C) the anterior Sylvian point and D) the IRP. The superior frontal sulcus (SFS) is constant and usually a continuous segment and correlates with the underlying frontal ventricular horn. Considered an important neurosurgical corridor. Posteriorly to the union of the SFS with the PreCS correlates to the hand motor activation area. See figure 8 and 9. The SFS/PCS meeting point is coronally related with the superior surface of the thalamus and with the body of the lateral ventricle just behind the foramen of Monro. The POSTERIOR CORONAL POINT (PCoP) it´s the craniometrical point located 3 cm lateral to the sagittal suture and 1 cm posterior to the coronal suture, this PCop locates the hand motor cortex underneath the bone, an important neurosurgical landmarc wich must be taken into account in procedures around this area. (Figure 10). 3b-The superior Rolandic point (SRP). The Superior Rolandic Point (SRP) corresponds to the most superior point of the Central Sulcus. Located 5 cm posterior to the bregma. (figure 11). This craniometrical point is used for the exposure of the precentral and the postcentral gyri. The Intraparietal Sulcus (IPS) can be a continuous or interrupted sulcus on the parietal parenchyma, usually parallel to interhemispheric sulcus and separating the superior from the inferior parietal lobules. The IPS is related anteriorly with the post central sulcus (PCS) and posteriorly it usually continues with the transverse occipital sulcus. (figure 12). It is important to locate the IPS/PCS meeting point because: 1- Anteriorly to this point we find the postcentral gurys. 2- It can be use in a neurosurgical procedure as a safe starting point for the transulcal or transcortical opening. 3- It is related on its depth to the ventricular trigone. Figure 13. 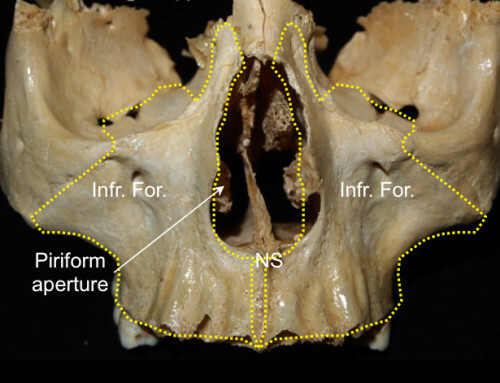 The IPS/PCS craniometrical point is located 6 cm anterior to Lambda and 5 cm lateraly to the sagittal suture. (figure 13). The external occipital fissure (EOF) corresponds to the extension of the Parieto-Occipital Sulcus (POS) into the brain convexity. It is usually a deep transversal sulcus on the medial side of each hemisphere. Figure 14. The EOF/POS meeting point is a useful surgical landmark because it defines the parieto-occipital sulcus wich divide de precuneus (parietal) fron the cuneus (occipital) . Figure 15. Figure 16. This sulcal key point (EOS/POS) lies underneath each paramedian area corresponding to the angle between the sagittal and lambdoid suture. The craniometrical position of Lambda in adults is around 25 cm posterior to the Nasion, 13 cm posterior to the Bregma and 3 cm superior to the Opisthocranion (not to be confused with the Inion). Figure 16. 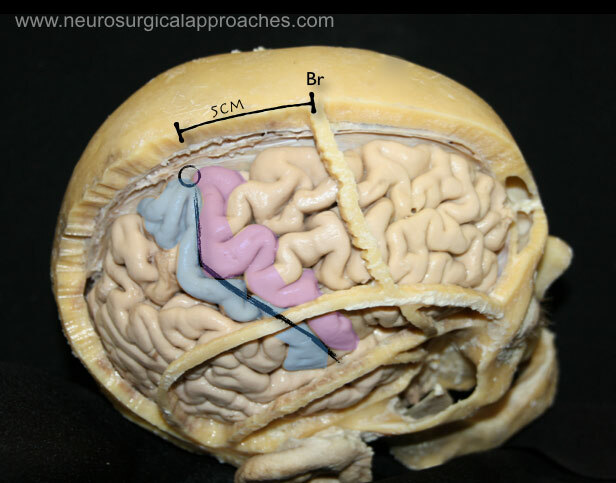 In this picture we can appreciate the POS and Calcarine sulcus wich divide the posterior medial brain surface in to the Cingularis gyrus (on the precuneus depth), the Precuneus, the Cuneus and Lingualis Giri. The Euryon was found to be over the superior aspect of the supramarginalis gyrus (SMG). The SMG and Angular Gyrus (AG) belong to the inferior parietal lobule and is separated from the superior parietal lobe by the intraparetal sulcus, as you can see on figure 19 and 20. The Sulcus that separates the Supramarginalis Gyrus (SMG) and the Angular Gyrus is named “The intermediary sulcus of Jensen” (ISJ) (Figure 20). The ISJ usually continues with the IPS. The SMG is the gyrus found at the most posterior point along the Sylvian fissure and the AG is in the gyrus found at the most posterior point of the superior temporal sulcus (STS). Regarding to the possible surgical complications on parietal approaches, in the dominant hemisphere language impairments can be related to the damage of the SMG and AG (Wernickes area). Deep in the Superior Temporal Sulcus (STS) we can access to the inferior horn of the lateral ventricle. On its posterior third portion the ventricular atrium also can be approached. (Figure 21). Figure 23. The Posterior Temporal Point (PTP) was shown to be 2-3 cm posterior and inferior to the Sylvian fissure. Figure 24. The most prominent occipital cranial point is called “The opisthocranion” (fig.24) Figure 25. The opisthocranion is related to the superior aspect of the calcarine fissure and the base of the cuneus. The distance from the opisthocranion to the occipital base or inion is of approximately 2 cm and corresponds to the occipital Lingual gyrus (green). The distance from Lambda to the opisthocranion is between 2 and 4 cm and indicates the occipital cuneus (purple). see fig 25. Interhemispheric approaches through occipital craniotomies done below the lambda usually have the advantage of dealing with fewer bridging veins than in parietal craniotomies. R.S. Tubbs, G. Salter, J. Oakes. Superficial surgical landmarks for the transverse sinus and torcular herophili. J. Neurosurg. 93: 279-281, 2000 S. Gusmao, R. Leal, A. Arantes. Pontos referencias nos accesos cranianos. Arq Neuropsiquiatr. 2003; 61 (2-A): 305-308. Martinez F., Laxague A., Vida L., et al. Anatomía topográfica del asterion. Neurocirugia 2005; 16: 441-446. 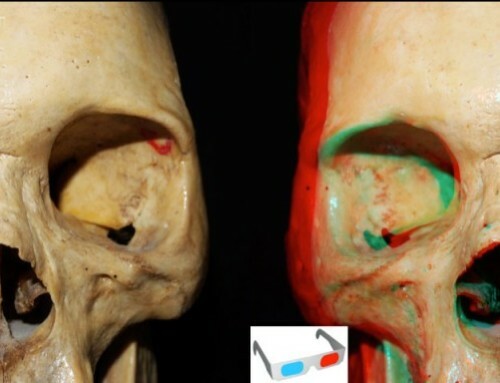 Ribas G.C., Ferreira R., Junqueira A. Anaglyfphic three-dimensional stereoscopic printing: revivan of an old method for anatomical and sufical teaching and reporting. J. Neurosurg 95: 1057-1066, 2001. Ribas G. C., Ribas E.C., Junqueira C. The anterior sylvian point and the suprasylvian operculum. Neurosurg Focus 18 (6b), 2005. Kendir S. , Acar H.I., Comert A., et al. Window anatomy for neurosurgical approaches. J. Neurosurg. April 10. 2009 Ribas G.C., Yasuda A., Ribas E.C., Nishikuni K. Surgical Anatomy of microneurosurgical sulcal key points. Neurosurgery 59: ONS 177-210. 2006.